That is good for all cyclistst but especially good for fast and (relatively) heavy velomobiles. I can travel much more efficient with a 35kg velomobile when I don't have to come to a full stop. Two thumbs up! I must start planning that Dutch holiday! It's a little too pie-in-the-sky for me. I mean, it looks great and all, but is it really the best use of resources? And this new magical cycle path, will it connect to anything? How will this project fit into the bigger picture? I don't want to rain on anyone's parade, but I would like to verify that this is not just a waste of money on some vanity project. Fears of such frivolous spending were thrust to the foreground of my consciousness again last week during the local elections. I never thought that their cycling policy would stop me from voting for the local green party, but it did. Their plan was to increase the budget for cycling and cycling infrastructure, and then blow all the money on two bridges to nowhere. I don't know, maybe I'm just paranoid. Put me down as "cautiously optimistic". The idea captures the imagination although on less well used routes it might be better to have a sensor see the cyclist and give an assured green light. I remember in Portugal the traffic lights are able to detect speeding cars and they then turn red as a punishment. Back to the LED's, you may still want to reduce speed for the real life crossing bit. J..: It will connect up. Everything does here. It's not the same as the UK. Mark: There are many ways that traffic lights here prioritize cyclists already, including defaulting to green for cyclists and giving cyclists two greens per cycle. What with cycle routes also avoiding many of the traffic lights altogether, they don't really impact that much on a cyclist. very interesting. Thanks for posting. Portlanders have been enamored with Copenhagen's Green Wave and this "Evergreen Wave" is an interesting 'enhancement' of that idea. I agree with some of the other commenters though, in that it seems like a neat idea, but I'm skeptical of it's value for the cost it takes ton install. @J., read the comments on the original idea on Fietsberaad. It all looks nice but will probably amount to throwing expensive tax money away. Especially if you have a look at the trial site! Frits, you're always so cheerful and positive. The location is here on streetview. I don't see any good reason why it couldn't work in that location. In the UK the traffic lights are designed for the cars, although not very well. I rode part of the National Cycle Network in South Wales last summer and a normal right turn in Newport (we "drive" on the left) became three sets of individual lights taking perhaps three minutes to cross. Equally it was very hard to see exactly where the cycle route was going. David, I admire your optimism, but not everything in Holland connects, or connects equally well. I know the site, I used to work just south of that crossing on the Schiekade. It's a place where a system like that could definitly work, although the cycle paths are very narrow. Overtaking is difficult if not impossible and I fear this will cause tensions between those trying to catch the light and those who aren't. If I read the article correctly, this is a pilot program with just one traffic light. That eases my fears of wasting money somewhat, but it may prove too small for its own good, which is the opposite problem. A green wave is only a wave if you can ride it past multiple junctions. People might find the benefit of this small pilot unimpressive. Hope it works out, though. LED assisted cycling might be nice. J..: It always amuses me to hear such concerns. I know it's not all equal, but by the standards of anywhere else, everything here joins up to a wonderful extent. 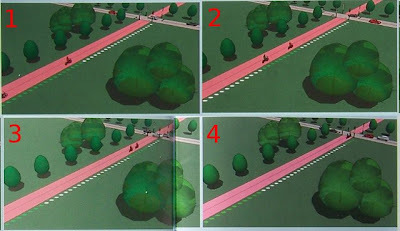 Your "very narrow" cycle path looks like heaven compared with proposals elsewhere. It's true that a one off might not be particularly impressive or perhaps the whole thing might simply not work. However, it's the sort of experiment which is extremely rare anywhere but here, and which I think is worth reporting simply because something new is being tried for cyclists. A simple question: do we need a string of green Christmas tree lights in the surface of a busy cycle path, inviting the cyclists to adjust their speed? Apart from road dirt and other cyclists obscuring the lights, is it advisable that cyclists have their attention on these lights instead of their co-travellers? I still say that the idea as suggested is a serious waste of good tax money that might be spent in a lot more useful ways. Frits: You may be right. It may turn out not to be the best possible treatment of this junction. Can it not be seen as the latest in a long series of experimental schemes ? This willingness to try things is what has resulted in the excellent conditions which cyclists in the Netherlands now have. Personally, I think this is worth trying. It may be effective, it may not be effective. As yet, we simply don't know. Dissatisfied Dutch cyclists might like to try cycling in the London Borough of Waltham Forest. Its 1,300 streets have just five dedicated cyclist-only crossings. The cyclist is kept waiting, subservient to the greater importance of motor vehicles. One of these crossings has been out of action because of roadworks since last September, and cyclists are left to find their own way across five lanes of traffic when there's a gap in the flow of vehicles. I think any British cyclist will understand all too well why David chose to move to a society which, compared to Britain, is a cycling paradise. The idea of a green wave over a long distance is nice but it does mean that the lights work mostly from a clock and not from actual traffic movements and that may not be the best solution overall. Taking a different view, the project might be worth it purely as a curiosity, I noticed plenty of wonderful art on the road side last summer, it all adds a bit of fun to the journey. My comments on the narrow paths are still valid though. I don't care if other places in the world have crappier paths than this one. Either the width of the path is sufficient, or it isn't. The rest of the world is irrelevant. I've cycled there many times, and I constantly had problems overtaking slower cyclists (and when you ride a Hurricane, that basically means ALL other cyclists). There were roadwork last time I was there, so maybe things will improve. I agree that experimenting is good, and I applaude the effort. I'm not sure, however, that the results of this small trial will be representative of a similar scheme implemented on a larger scale. My sense tells me this experiment may underperform in comparison. I hope this thing makes it to a larger scale project. J..: I do understand exactly what you mean. I also have the problem of being "the fastest commuter" and doing a lot of overtaking. My commuting route is used by a lot of school children, riding two, three or even four abreast and in no hurry at all on the cycle path. Sometimes they really do get in the way and it is difficult to pass. My Mango is wider than your Hurricane, and as Harry commented at the top, it's a bigger pain to build up speed again with a velomobile. However, the experience is still night and day here compared with anything in the UK, and that's really what this blog is about - making known outside the Netherlands just what is possible if you built decent cycling infrastructure as prevalent here. If the UK could build the equivalent of the worst infrastructure in the Netherlands it would be a huge advance. This technology could be implemented for auto use to. Well, it'd be the same infrastructure. I had imagined this exact operation myself, cool to see I'm not the only one. I just HATE having a light turn yellow when I'm 4 seconds away from passing under, causing me to slam the breaks on, either in my car or on bike. It's actually stressful, approaching green lights. At various places in The Netherlands, another kind of "digital green wave" is installed. The system is called ODYSA and consists of variable message signs that display the speed to maintain to catch the next green light. The system can also be seen on the N282 trunk road between Breda and Tilburg. Furthermore, the city of Eindhoven is experimenting with an in-car version of ODYSA. here is such a setup in action in Odense, Denmark. might be of marginal direct value, but has huge marketing value! cycling is hi-tech, and all that. This is actually quite odd on the Schieweg, the main cycling route from Rotterdam north of the A20 motorway to the city center has been moved parralel to it (from north of Schiebroek to the Ringdijk, Rozenlaan, Bergsingel, Noordersingel, Teilingerstraat, just the last section of Schieweg), where there are special half-cycle streets (half the road is smooth pink tarmac for cyclists, half is rough paving for cars, no markings). It's designed as a highway to cyclists, but only a access road for cars. They would be off much better investing this money at other bottlenecks where cyclists still preferentially take the same routes as cars.